SINGAPORE (AP) -- World stocks mostly edged up on Monday after the U.S. and China said they were closing in on a trade deal, without giving a timeline, and amid optimism over corporate earnings. Britain's FTSE 100 was flat at 7,433 while the CAC 40 in France gained 0.1% to 5,509. Germany's DAX was also up 0.1%, at 12,017. On Wall Street, the future contract for the broad S&P 500 index was flat, while that for the Dow Jones Industrial Average was 0.2% higher. U.S. Treasury Secretary Steven Mnuchin said Saturday that the U.S. and China were moving closer to an agreement on trade. Speaking on the sidelines of the International Monetary Fund and World Bank spring meetings, Mnuchin said the U.S. and China held phone discussions last week and he wasn't sure if more face-to-face meetings would be needed. He did not give a timeframe for when negotiations might be wrapped up. Mnuchin added that the proposed agreement has seven chapters and will allow both countries to set up enforcement offices to make sure the deal is followed. Chinese foreign ministry spokesman Lu Kang said Thursday that the discussions were "moving forward" and "new substantial progress" was made. Investors have meanwhile been supported by strong earnings, especially from U.S. banks. Traders are waiting to see if other big companies do equally well in the days ahead, as a judge of the strength of corporate America. "Further encouraging readings during the remainder of the earnings season should feed into the broader risk sentiment narrative and help improve investor confidence, as long as the releases do not reveal any negative surprises," Lukman Otunuga, a research analyst at FXTM, said in a commentary. Trading was more mixed in Asia, with the Shanghai Composite index 0.3% lower at 3,177.79. 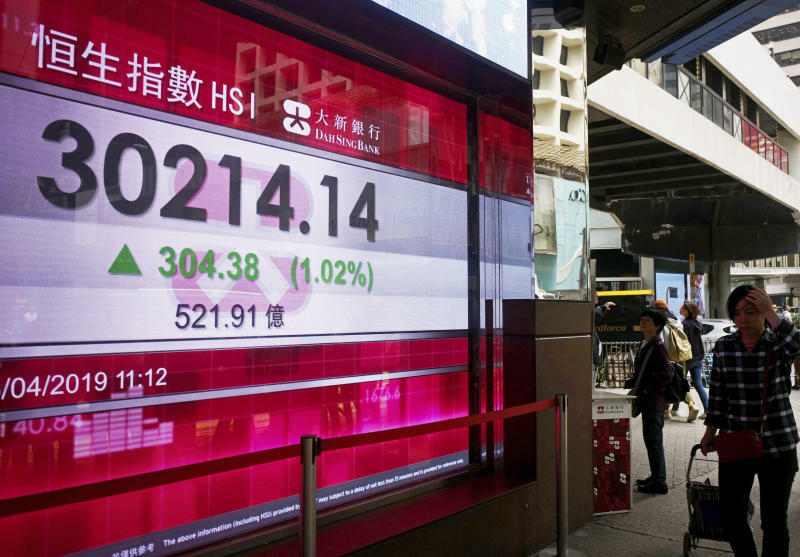 Hong Kong's Hang Seng gave up 0.3% to 29,810.72. Australia's S&P ASX 200 was flat at 6,251.40 while Japan's Nikkei 225 index jumped 1.4% to 22,169.11. The Kospi in South Korea added 0.4% to 2,242.88. Stocks rose in Taiwan but fell in Singapore and the Philippines. ENERGY: Benchmark U.S. crude shed 68 cents to $63.21 per barrel in electronic trading on the New York Mercantile Exchange. The contract gained 31 cents to close at $63.89 on Friday. Brent crude, used to price international oils, lost 73 cents to $70.82 per barrel in London. It added 72 cents in the previous session to $71.55. CURRENCIES: The dollar weakened to 111.96 yen from 112.01 yen late Friday. The euro rose to $1.1314 from $1.1300. How Should Investors Feel About Ascena Retail Group, Inc.'s (NASDAQ:ASNA) CEO Pay?